Please note that the Bob's House of Basses web site is now part of ProdigyInstruments. All Bass products can be bought from here!!! The Philharmonic Donations Program is back! Customers who buy from Prodigy Instruments can designate 10% of each instrument and case sale, 5% of each strings and accessory sale, and 3% of rental sales on purchases over $50 back to a music program that needs your help! Don't see your organization at our checkout? Simply email our coordinator Cassie at cassie@prodigyinstruments.com, and ask how you can add your organization! Prodigy Instruments is proud to present.. The Musilia S3 model weighs about 5 lbs! Click here for more information about Musilia Cases!!! New Line of Fine Instruments! We at Prodigy Instruments are proud to offer our new "Gavriel Octavian" Romanian Violins, Violas, and Cellos made exclusively for Prodigy Instruments! 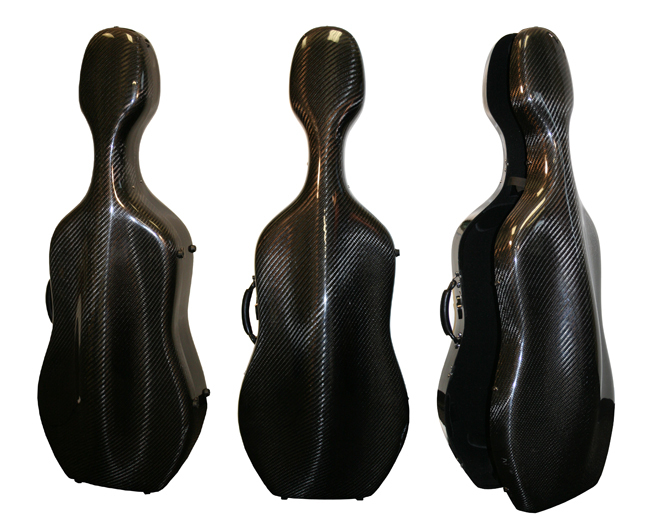 The Eclipse Carbon Fiber Cello Case! Without straps it weighs less than 8 lbs! Click for more info on the Eclipse Cello Case! We at Prodigy Instruments are extremely excited to announce a new partnership between us and two very special European Luthiers. We are proud to offer to the public our new "Gavriel Octavian" Romanian Violins, Violas, and Cellos and "Hans Ludwig" German Violins!, made exclusively for Prodigy Instruments! New Super light Cello Case! The CACL-K1 - Carbon Fiber Cello Case is onstructed of carbon fiber reinforced fiberglass to achieve the ultimate in strength, durability, and low weight. The average weight is only 10.3 pounds Great colors � blue, black, silver, green, and red Click here for more info! 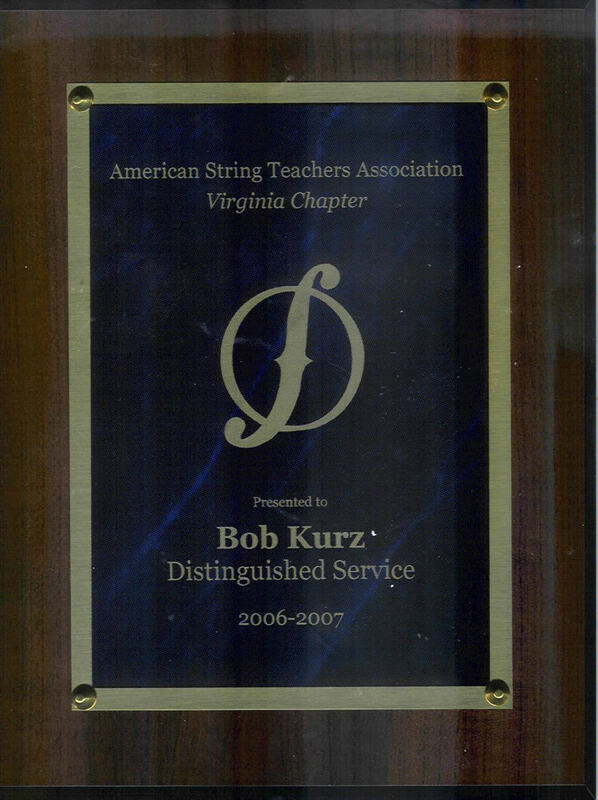 Robert Kurz and Prodigy Instruments recently received a Distinguished Service Award from American String Teachers Association in Virginia (click for larger picture or click here to see the announcement in ASTA's newsletter). Welcome to our world of handmade, world-class bowed student string instruments. We offer different instruments to suit different players and budgets. So, you can order the right violin, viola, or cello, and be assured that your instrument will affordably allow you to play to the best of your ability. We offer rentals, strings, accessories, and luthier supplies, too. Whether you need to rent a violin, viola or a cello, buy violin strings or luthier supplies, you've come to the right place. Need new fiddle strings? Seeking a violin rental? Looking for a quality student violin? We are here to serve you. You can buy or rent violas and cellos. 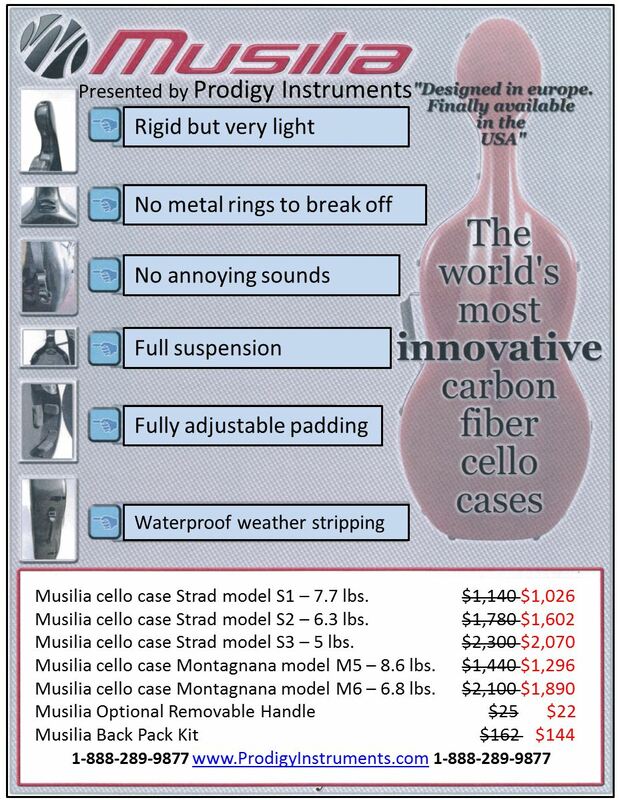 If you need viola strings, cello strings or a metronome , we have it all. We appreciate your visit today, and look forward to serving you! Prodigy Instruments is committed to supporting Arts and Education by making donations to the National Philharmonic based on a percentage of our sales! These funds will be donated to the National Philharmonic's "All Kids, All Free, All The Time" program! For more details about the project and how you can help, click here. The audience hushes, lights dim, airborne anticipation electrifies the concert hall. The first notes vibrate clear, deep, and rich, resounding from the flamed maple to the far reaches of the hall -a showcase of technical expertise and tonal purity. From the first stroke of bow across string, the audience is yours...the night is yours. When your moment comes, will you be ready? Will you have an instrument that can take you as far as your talent can go? Do you have a string instrument with the playability and performance to achieve your goals, your dreams, your destiny? A superior talent deserves a superior instrument. That's why Robert Kurz founded Prodigy Instruments. A performer and teacher, Robert had a mission to find string instruments for his students that were superior quality, but affordable in price. He Traveled the globe until he found the craftsmen he would partner with to form Prodigy Instruments -first class violins, violas, and cellos available to all classes of musicians. Prodigy instruments are meticulously hand crafted in the classic European tradition. See the superior wood, materials and process used to make your Prodigy Instruments . Is a Prodigy Instrument the right choice for you or your students? These violins, violas, and cellos are surprisingly affordable. Find out who can benefit the most from a Prodigy Instrument . Superior Playability and sound allow you to play to the best of your ability. Let your true talent shine through, achieve your goals, and launch your career with these impressive string instruments. Polishing and Cleaning: Pirastro, Hill, Hidersol, Kolstein. We have over 3,500 individual available for shipping at all times! Yes, you can rent our instruments! 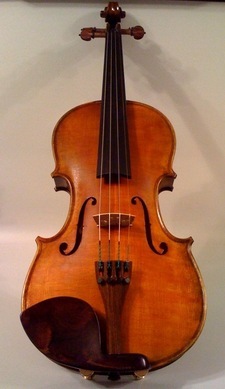 or call us if you are interested in renting a Violin, Viola or Cello!